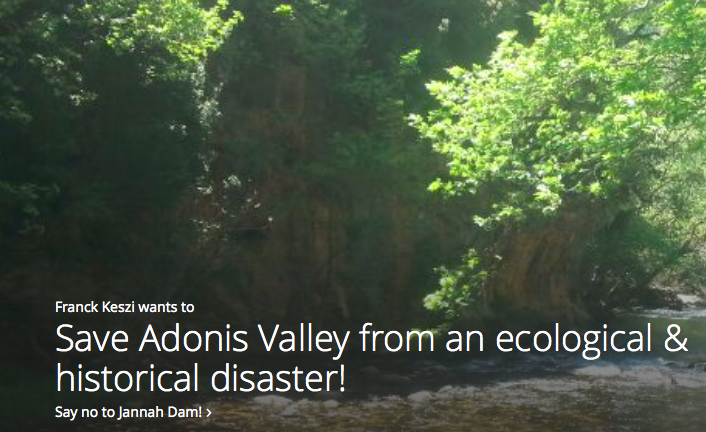 « dams, privatization, corruption, Blue Gold — and the critical need to protect our water in Lebanon! It is tragic to see the lack of cooperation between two of Lebanon’s ministries. While the ministry of Environment clearly asked to stop this project, the Ministry of Energy went along with it anyway. Having knowledge of Lebanon’s corrupted ways, I question their true motives. These sudden efforts of finishing a project (building the dam) is unique to Lebanon’s slow habit of getting things done. How the Energy of Ministry is showing great care to hydroelectricity, drinking and irrigation water, makes me skeptical of their good intentions.The building of the dam does not even suit the geology of the location. It would come as no surprise if the government or a smaller establishment of the like is benefiting from this project immensely. Countries like Germany and France have assisted by doing the required studies to prove the project’s side effects. Lebanon however must take action on its own to stop this illogical act. Im sure that there are other ways to obtain the goal intended of this project. We must also consider the damage to one of our few touristic sites when affecting jeita springs. I always believed that Lebanon can almost solely live off of Tourism. Considering Lebanon’s beauty and amazing nature, it is disappointing to see how the Ministry of Tourism does not make a greater effort of making use of Lebanon’s beauty. This concludes to my point that there should be an improvement in the way the ministries of Lebanon collaborate. We must also aware more people to take action in stopping this act. I however believe that our initiative may possibly be fruitless against the power of Lebanon’s corruption. Studies should be made to propose an alternative to obtaining the intended goal of the Ministry of Energy(for example: the project proposed concerning Afqa and Rouaiss). This may provide an effective rebuttal of the matter. Well i can start out by saying i signed the petition! It’s for a great cause and i think everyone should support it. It’s really sad how all people are thinking about everything these days except our nature. They said that by building these dams, so much of Lebanon’s history and culture will be destroyed, “abort this dam project which will destroy Nahr Ibrahim region, the historical valley of Adonis, the Biosphere of Jabal Moussa and probably the Jeita grotto!” This is thousands of years of natural beauty and culture we are talking about, how can they even consider destroying it? Electricity and hydraulics are really not as important as our beautiful environment. France and Germany even see the harmful effects when our own government wont even see it! It’s really shameful to admit that our government would go to this extent to make a couple extra dollars. Let’s not forget the economic values these natural reserves have to Lebanon. Ever since i was young and used to visit Lebanon, The Jeita Grotto was the place we would visit every summer. Tourists come from all over to see this magnificent piece of culture. Schools take their students to see them. It even entered in the 7 new wonders of the world! Lebanon is seen through these magnificent features, it would be a real tragedy if anything was to happen. So many studies have been made by people all over the world to prove that building these dams is a horrible idea, and still for some reason, our own government, the people who have families and children who would be kept from seeing these sights, can’t seem to understand the point. I really appreciate and admire everyone who is fighting for this cause. It is really something worth fighting for and i hope their voices get heard. After watching the interview I became really curious to know more about the government’s point of view as to why they are so determined to build this dam. There seems to be a missing link. Knowing that it is not pragmatic nor efficient and it will be harming the nearby agricultural lands, I cannot see any feasible reason to build it. In addition, as mentioned in the interview, that by building this dam they will burying behind part of the Lebanese historical heritage and ignorantly blemishing the beauty of nature. After all, it is really disappointing to see how such a critical project could be conducted without an appropriate detailed prior study. This is shameful, unscientific, unethical and purely selfish. It is ironic to see ministries breaking the law so blatantly!It emphasizes how more educated and rational people should be in charge. Every Lebanese citizen should sign this petition with no reluctance! Lebanon’s government could prove for the 100th time that nature is the least of their concern. I wish I had seen this before I definitely would have signed the petition. I’m shocked how the Ministry of energy can be so ignorant, nature is our main source of energy, therefore he’s supposed to care about it like the ministry of environment does and even more. This is so ridiculous, we depend on nature to survive, we need it and not the opposite. What is the outcome if we fix something, but we destroy something else like the ministry of energy is doing. All these years they barely cared about the Lebanese population’s need for energy, where did this goodness come from? Surely, with such a corrupted government, monetary income is behind it. Unfortunately, money is the only thing politicians care about. I wish they could love the green of the nature as much as they love the green of the dollar. Lebanese are so good in copying foreign countries, but just when it comes to fashion and music. When the subject is environment, foreign countries’s opinion are not heard. In order to Germany and France interfere, and argue that the project should be stopped means that it really should be stopped. It is really disappointing that our government doesn’t give value to the beauty that Lebanon has. Jeita grotto is one of the most beautiful places I ever been to, its spring cannot be affected. It is one of the most visited places by tourists, and it’s really important for the lebanese economy, so the construction of the dam must have a huge monetary income in order to government sacrifice such a beautiful place. I can’t understand how someone can be so indifferent to the importance of nature. Our country could be as good as any other one if we only had a democratic, transparent, and truthful government. It is funny how the government haven’t realized yet how important the nature is. It’s known that we depend on nature and we cannot survive without it. The soil is essential for the survival of the plants, which we totally depend on. How it comes the government can ignore the importance of the environment. Unbelievably, the ministry of energy came with an ”innovative” idea to generate energy. What a lie. They don’t do anything if there is no money involved. Germany and France interfered, and still Lebanon’s government didn’t ”listen” to them. The construction of the dam will not only destroy the habitat of many animals, but also affect the spring of Jeita. Such a beautiful place cannot be under risk. The government needs more educated people who cares about nature, so they can protect it. I believe we have a lack of awareness when it comes to our environment. People should learn and know about other species. For example, in the amazon forest, more than 1000 species exist in 1 m2.